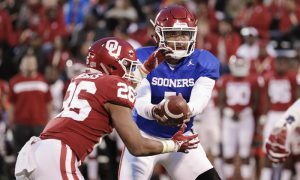 Here is everything you need to know about the Big 12 Championship Game in our Oklahoma vs. Texas preview and prediction. 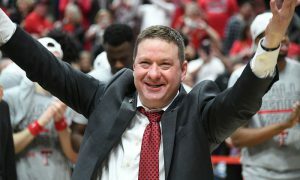 Fun Fact: Saturday marks the first time since 1903, and just the third time ever (also 1901), that the two schools will meet for a second time in a season. Humphrey was the star of the show in the Longhorns’ win over Oklahoma earlier this season. He had nine catches for 133 yards with one touchdown. He even had a touchdown pass in the game. 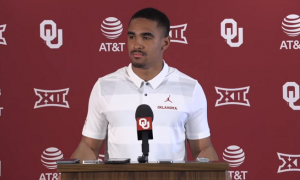 Humphrey is the key to torching an Oklahoma pass defense that is the worst in the Big 12 based on efficiency. Humphrey has slowed down the past two weeks (ISU, KU) with just nine catches for 110 yards. The prior two games (TTU, WVU) he had 17 catches for over 300 yards. 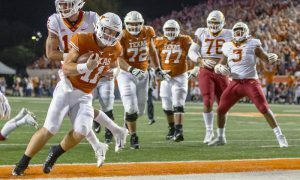 Johnson was on fire for the Longhorns before he was suspended for the Kansas game last week for violating team rules. Tom Herman said it was a, “one-game thing”. Hopefully Johnson didn’t get rusty with the week off. In the five games before the KU game, Johnson had 39 tackles and 4.5 sacks. He will be busy on Saturday trying to play the run and the pass, while trying to keep the best offense in the nation in check. How can it not be? He’s likely to be a Heisman finalist and leads the Big 12 in total offense by over 30 yards per game. 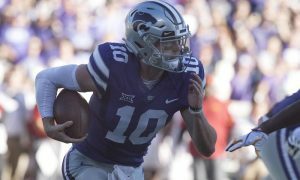 Against Texas in October, he threw for over 300 yards and four touchdowns, along with 11 carries for 92 yards and a score. He’s the first FBS player to ever average at least 300 passing yards per game and at least 60 rushing yards per game in the regular season. He accounted for 48 touchdowns this season. Since it’s OU, I’m not even going to give you a defender. This team’s best defense is its offense. Due to injuries, Brooks has become Mr. Reliable in the backfield and he keeps getting better. Against Texas, he only had three carries for 34 yards. But the last three weeks he has torn it up, averaging over 170 yards per game, while averaging 20 carries per contest, plus six touchdowns. *If you really want a defender, look to linebacker Curtis Bolton. He’s got 20 tackles the past two weeks and led the Sooners with 13 tackles against Texas earlier this season. 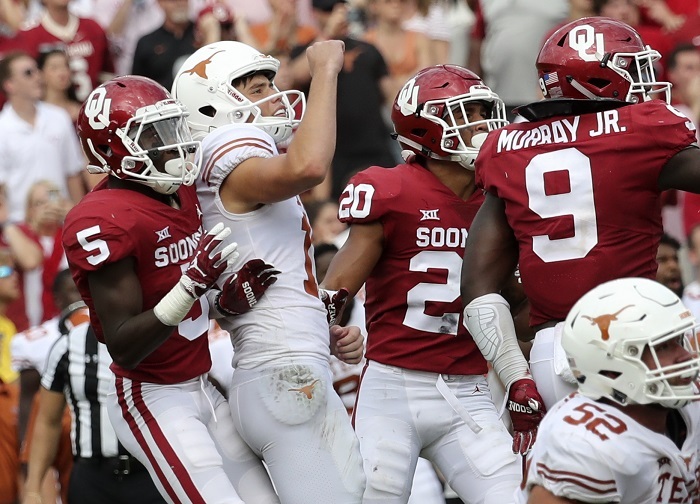 The Longhorns need to stack the box, stop the run (or try to), and then pray their secondary can somehow slow down, not stop, the Oklahoma Sooners offense. Texas does have a very good secondary, led by Kris Boyd and Davante Davis, along with Big 12 Defensive Freshman of the Year Caden Sterns. The linebackers need to be focused on getting behind the best offensive line in the game. If you see the holes Kennedy Brooks has been running through the last couple weeks of the season, it would give you or I optimism to be check back in on our eligibility. Keeping OU under 40 points would be a miracle, considering no one has done that since Army on September 22nd. The Sooners need to score, score and score some more. As mentioned above, this team’s best defense is it’s offense. 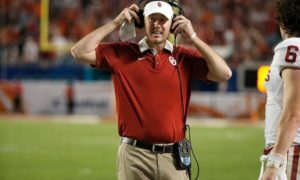 Lincoln Riley realized that last week against West Virginia when he went for it on 4th and 5 from just over midfield with two minutes left in the game up three points. He was not going to let his defense blow it against Will Grier and the Mountaineers. Oklahoma needs to have the same attitude against Texas. 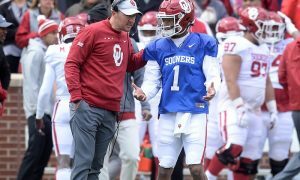 It’s about Kyler Murray, Marquise Brown (11 catches for 243 yards last week vs. WVU), and Kennedy Brooks. Get ’em going early and often. The Sooners have the players and the coaching staff with more experience in these types of big-game settings. Plus, is OU going to lose to the same team twice in one season? I don’t see it. Also, if you recall, a big part of OU’s fourth quarter comeback against Texas, which ultimately came up short, came from Kyler Murray’s legs. So don’t be shocked to see Lincoln Riley continue to use Murray more on the ground. In fact, that’s been done lately. In October, Murray averaged 8 carries per game. Since then, he’s averaged 11 carries per game and the last two games he’s had 213 rushing yards. That will be the difference as Oklahoma gets the win and its fourth-straight Big 12 Championship.